Pressure on Europe’s journalists as they do their jobs saw no let up during the fourth quarter of 2015, according to a survey of verified incidents of violations reported to Index on Censorship’s project Mapping Media Freedom. Between 1 October and 31 December 2015, Mapping Media Freedom‘s network of 19 correspondents verified 232 reports that were submitted to the database. Each report is reviewed for factual accuracy and confirmed with local sources before an incident is publicly available on the map. The platform — a joint undertaking with the European Federation of Journalists and Reporters Without Borders and partially funded by the European Commission — covers 40 countries, including all EU member states, Albania, Belarus, Bosnia, Iceland, Kosovo, Macedonia, Montenegro, Norway, Russia, Serbia, Turkey and Ukraine. 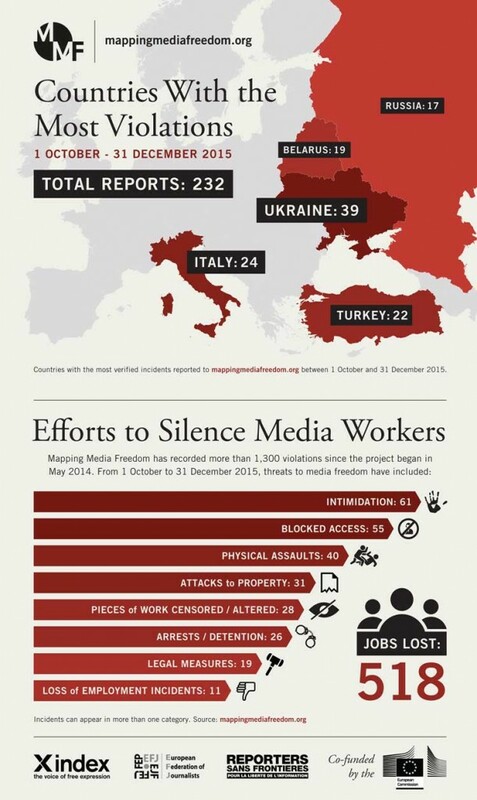 Since it was launched in May 2014, the map has recorded over 1,300 violations of media freedom.